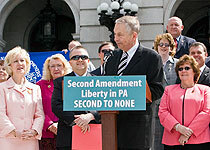 State Rep. Sue Helm (R-Susquehanna Township) joined other lawmakers at the 6th Annual Pennsylvania Right to Keep and Bear Arms Rally held May 10th in Harrisburg. Larry Pratt, executive director of the Gun Owners of America, is at the podium. State Rep. Sue Helm (R-Susquehanna Township) joined several hundred gun owners and other lawmakers at the 6th Annual Pennsylvania Right to Keep and Bear Arms Rally, held Tuesday on the front steps of the State Capitol. Organized by State Rep. Daryl Metcalfe (R-Butler), the event highlighted the need to protect and preserve the Second Amendment rights of Pennsylvanians. Several speakers called for enactment of the Castle Doctrine, sponsored by State Rep. Scott Perry (R-York/Cumberland). House Bill 40 was approved by the state House last month by a vote of 164-37. Helm voted in favor of the bill. Similar legislation has passed in the state Senate. HB 40 would allow citizens to use force, including deadly force, against an attacker in their homes and any places outside of their homes, businesses, vehicles or state parks where they have a legal right to be if they believe they are in imminent danger. The measure would also protect individuals from civil lawsuits by the attacker or the attacker’s family when force is used. Rally speakers included David Keene, president of the National Rifle Association; Kim Stolfer, chairman of Firearms Owners Against Crime; and Larry Pratt, executive director of the Gun Owners of America.